Ensure you get the most out of your sailing adventure. Each video is chock full of maps, tips, insights and hints, along with vivid images of the most beautiful spots! Cruisers often invite each other over for drinks or dinner to swap info on where they’ve been. And in that spirit, this series is our way of sharing what we learned (and that isn’t in the guidebooks) with you. It’s if we had stopped by your boat and sat down with you for a few hours to go over the charts and give you our insights and tips, suggesting where to go, what to avoid and what to look forward to. Many people cruise Mexico, but few get to the anchorages where we stayed. There are lots of maps in these videos. We review the overall geography, weather patterns and climate. This video series begins by familiarizing you with Mexico’s geography. Do you know where Huatulco is in relationship to Chamela or Chiapas? This series will teach you. Then we review the overall weather patterns and seasonal climate variations and how they will impact your itinerary. Is it better to start in La Paz or La Cruz? How’s the snorkeling in the Sea of Cortez in January? Then we dive into the good stuff as we visit each destination and check it out. 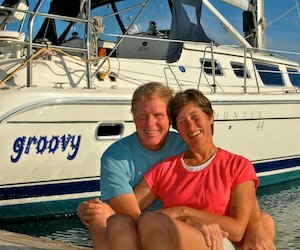 Like most cruisers, before we left on our cruise, we were buried in the bilge as we got Groovy ready for our voyage. Our plan was very simple: leave San Diego, turn left, and keep going until we got warm. Lots of first-timers tackle Mexico that way, and that’s unfortunate. Safe passage from San Diego to Cabo San Lucas is their primary goal, and things get fuzzy after that. The problem is, Cabo isn’t a place that is easy to stick around (it’s fun but very expensive! ), so as soon as you arrive you need to be planning your departure. But where to? For how long? What will you do there? And then where? We had no idea what was in this part of Mexico. Do you? The invaluable cruising guides we all use and rely on are awesome for telling you how to get in and out of the anchorages and where to find provisions at each stop. 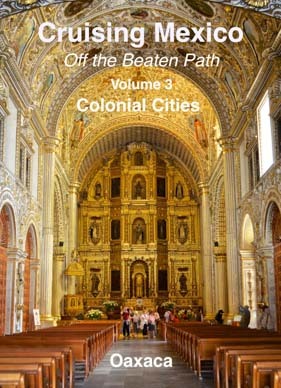 But it is very hard to get an overall understanding of what it is like to travel in Mexico by boat from these guides. 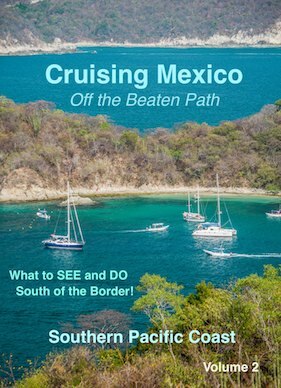 We got well off the beaten path that most Mexico cruisers follow, and I am hoping that by watching our videos you can benefit from all the research we did and all the great experiences we had once we got down there. I also hope these videos will get you juiced up about your upcoming cruise, and give you a happy break from all the boat projects and shopping sprees that seem to be the very essence of getting ready to go cruising. As a learning tool, these videos provide a fabulous way to study a lot of information in an easy to digest and highly visual and colorful manner. If you miss something, back up and play it over. Unlike books that you read privately, you can watch these videos with your spouse and talk over your thoughts and plans. Grab a bag of popcorn and come have some fun with us! This hour-long video (327 photos) covers Mexico’s overall geography, getting you familiar with what lies where. It presents a brief discussion of weather patterns, climate and the weather prediction tools we used for passage planning. After a brief glance at where all the marinas are located and which ones are good for summer storage, it offers an itinerary that will get you to all the best spots in two seasons, making sure you see each area when it is at its peak. 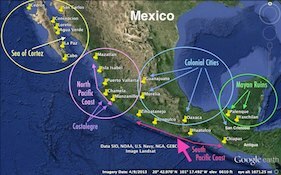 Then it reviews the anchorages between Ensenada and Manzanillo. This video has lots of maps! Hopefully, after watching it, you will have a good understanding of the layout of this part of the coast, the general distances between the anchorages, and what’s where in relation to each other. This nearly two hour video (380 photos) covers our favorite cruising grounds that lie between Zihuatanejo and the Guatemala border, way down at the bottom of Mexico. 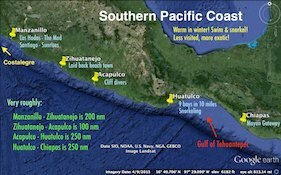 Although Zihuatanejo gets a lot of cruising visitors, the areas south of there are so distant that they are little visited by Mexico cruisers unless they are in transit to or from Central America. So it is an area that is not only more exotic but much quieter than other areas to the north. These areas are not as well documented by the cruising guides as the regions to the north, so this video fills in much of that void by showing loads of detailed maps and offering a ton of information about where to anchor, where to snorkel, and what to do, both around town and out of town. In this 40 minute video we take an inland trip to Oaxaca, one of Mexico’s most beloved colonial cities. 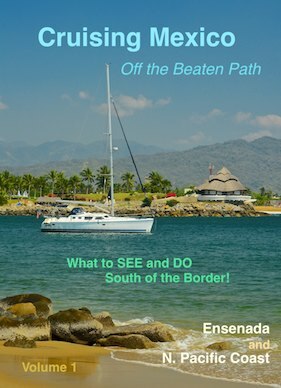 We explain how and where to leave the boat, different modes of transport to Oaxaca and what to see and do in this glorious city. For many travelers, Oaxaca is their favorite destination in all of Mexico, and it is a definite “must see” for cruisers. Boasting a lively town square and several grand churches, Oaxaca is filled with stately, centuries-old colonial architecture, yet has an engaging, energetic, youthful and artsy vibe. This entry was posted in News and tagged New, News, Non-Travel, Travel Guides by Roads Less Traveled. Bookmark the permalink.